themselves well in the junior B hurling semi final. The Barley House Wolves bowed out of the North American Finals at the semi-final stage to a very good Cusacks of Chicago. After having moved up a level to the B division, the Wolves had no other competition at that level in the local area and played just one scrimmage game against Fr. Tom Burke's. 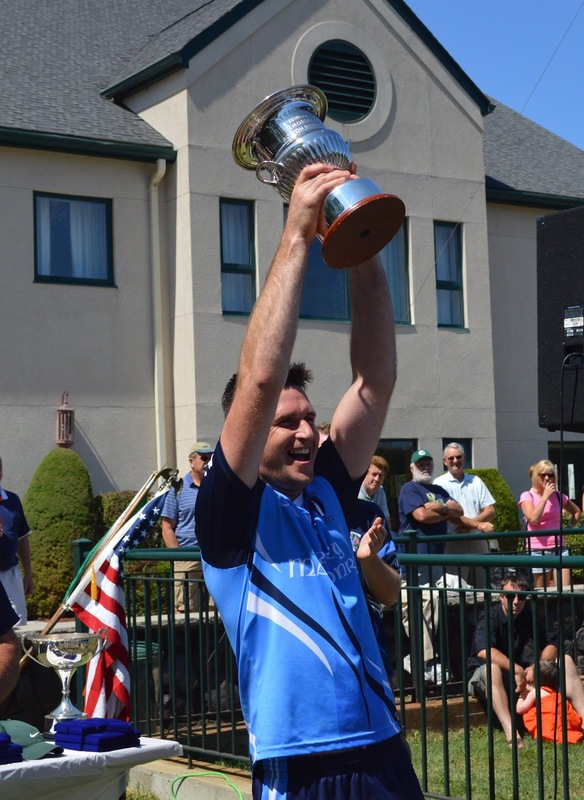 With a team that did not contain a single Irish born player, the New Hampshire lads acquitted themselves well and displayed some excellent hurling skills. There was a goal in it at the break, and in the second half Cusacks pulled away to advance to the final. The difference at the break was down to a goal from Martin Killane for the Chicago side. Chicago had held a slight lead at the time and staring into a 5 point hole the Wolves came back. Sean Naughton in the middle of the field put a couple of fantastic points over the bar from distance, and Dennis Trainor made a at least 3 fine saves to prevent a second. Alec Foley at wing back and Will Mullen at center forward also helped right the New Hampshire ship to the point where there was just the goal in it. Chicago opened up a considerable gap in the second half, in large part down to the prowess of Joe McLaughlin from the 65. McLaughlin put 3 in a row over the bar, and another was added by Michael Igoe. After Shay McShane netted for the Cusacks the New Hampshire boys rediscovered their scoring touch. Naughton accounted for two points and a goal close to the end. It was a first foray at the higher level for the National Guardsmen from the Granite State. With a little more help from the Boston based junior A clubs next year maybe we will see them go one step farther for the national finals. BHW: D. Trainor, S. McCarty, W. Perry, A. Foley, D. Pawlowski, M. Gregoire, S. Naughton, M. Barricklow, D. Williams, W. Mullen, P. Naughton, L. Ford, M. Reynolds. Connacht Ladies came through their first test with flying colours. The Boston girls were pitted against Notre Dames from Philadelphia, and after conceding an early first half goal settled down and went on to win the game with plenty to spare. Arlene Fox got the scoring off and was followed by Amy ring, then came a goal and a point for the Philly girls. Connacht Ladies then got their act together and goals from Grainne Field, Ciara Donnelly, and Jane Ward before half time, along with some well taken points had the Boston side in a 19 point half time lead. The Philly side made a better fist of things in the second half, but there was too much catching up to do. Final score was 4-17 to 3-9 and the Connacht Ladies have a final to look forward to. All focus as Sean Conneely tries to stop his mark. 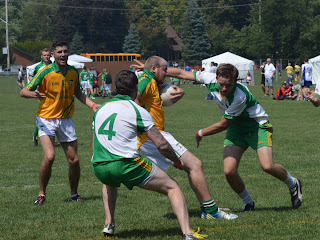 The Connemara Gaels had plenty to do to dispose of a scrappy Young Irelands from Philadelphia in the semi-final. At the break Philly were ahead by 5 points after a goal from a penalty. The Gaels tried to contain the lively Philly forwards but the outlets that were available in the Boston final were not longer there. Noel Graham accounted for the goal, which was the first score for the Gaels. Both points also came from the boot of the Offaly man as the Gaels struggled. The Boston side came good in the second half however. With 10 minutes to go the sides were on level terms. Graham, Coleman Mulkerrin, Pat McNicholas, Kevin McGrath all got on the scoreboard. Lee Cullen moved to the middle of the field and the Gaels fortunes improved there. A Sean Conneeley goal capped off a fine comeback, and the Gaels find themselves in tomorrow's final facing a fancied Ulster side from San Francisco. Final score, Gaels 2-14 Philly 1-12. Wexford Juniors went out at the first stage. 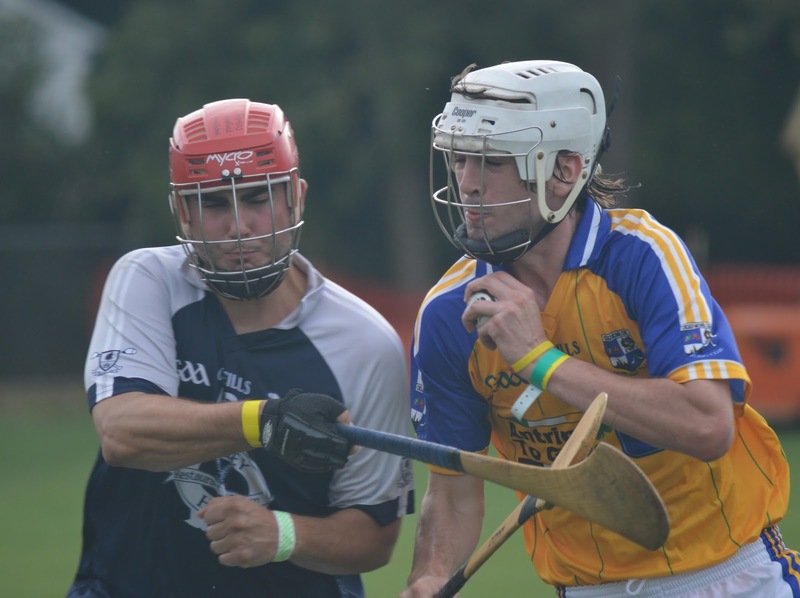 The Boston interest in the junior A hurling competition ended before it began as Wexford had some registration issues with players and were forced to play a challenge match against Vancouver on Saturday. 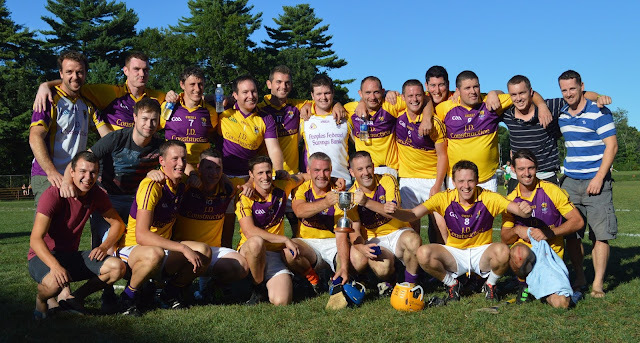 The Worcester Hurling club made their first foray into the junior C competition of the North American Finals this weekend and were very unlucky to go down in the quarter final to Milwaukee on Friday afternoon. Worcester had to overcome a strong challenge from Portland Oregon in an 8:00am game and were tied at the end of normal time 4-9 each. The Massachusetts lads pulled it out by a score of 4-14 to 4-10 after playing the 20 minutes of extra time and went on to face Milwaukee in the quarter final just 2 hours later! Worcester were leading at the break by a score of 2-6 to 0-5 but the extra period in the previous game took it's toll and Milwaukee went on to record a one point victory, 3-8 to 2-12. A great season for the club, which was founded just 3 short years ago. Donegal bowed out at the first hurdle in the junior B championship against their counterparts from Philadelphia. The Philly men had that bit of an edge over the Boston boys, who arrived a their hotel in Cleveland at 4:00 the previous morning. Donegal also called on the services of Gareth Ruddy, John Cunningham, and John Dougan to take the field. At the end of the first half the gap was 5 points in favour of the Philly team. The Boston team's goal came from a penalty taken by Christy McLaughlin, who also accounted for a handful of points. In the second half the Philly side pressed home their advantage, though at one point the Boston side looked to be making a run at it. Philly had built up a nine point lead, but a McLaughlin point and a second penalty reduced the gap back to 5. Philadelphia however went on to record two more goals and run out comfortable winners in the end. Donegal Boston: G. Ruddy, P. Doherty, M. Byrne, D. McBride, D. Doherty, S. Wogan, C. McLaughlin, H. Devine, J. Cunningham, J. Dougan, K. McDevitt, M. McDaid, M. Cutliffe. A Jubilant Connemara Gaels following their senior football victory on Sunday. Finals have a habit of producing the unlikely and making heroes out of players. On Sunday it was a case of the Connemara Gaels team leaving nothing behind on the field and getting their just rewards with a display full of heart and determination. Pat McNicholas who has played in 5 finals for the Gaels at different levels finally got his medal having been called up from the junior team to fill a vacant place. The Gaels started the game with intensity and maintained it all the way through to the final whistle. McAnespies looked as though the exertions from last Sunday's extra time and Tuesday night may have taken it's toll. An early goal from corner back Lee Cullen set the tone for the game, and a second from Kevin McGrath mid-way through the second half set the Gaels on the way. At the break the Gaels held a 2 point lead following a lively first half. An early goal from Lee Cullen got the Gaels off to a great start. Cullen made his way from corner back to the opposing 21 and fired a rocket past goalkeeper Paddy Coakley. Frankie Burke popped over a couple of frees to settle his side and ease into the game, and the remainder of the half was evenly contested. The Gaels were getting great performances from their midfield duo of Ryan Hyde and Damien Comer. Comer hunted down every ball he could, and Hyde was full of running and energy throughout. The score of the half came from Conor Daly, who converted after a good move that began well in the McAnespies back line. Damien Doolan and Noel Graham pointed for the Gaels and Burke for McAnespies before half time to make it a 1-5 to 0-6 score at the break. The second half saw two sendings off and the Gaels extend their lead to 6 points with 10 minutes to go. The goal was a soft one to concede from a McAnespies viewpoint. After Kevin McGrath had pointed to put the Gaels 3 up, an attempt at a short kickout ended up in the hands of McGrath again and the man from County Laois only had Paddy Coakley to beat and beat him he did. A scuffle ended up with 2 players receiving their marching orders; Declan Lally and Robbie Kiely were shown a second yellow each and the teams were down to 12-a-side for the last 10 minutes. The Gaels left McGrath up front on his own and at times he was the lone player in the opposing half as the Gaels got bodies behind the ball. It was now up to McAnespies to find it in them to come back and win it. All 5 subs were used to try and turn the tide, but none led to a change in the dynamic of the game. 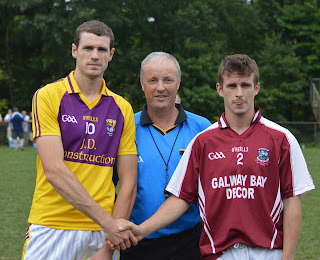 Both midfielders were changed, Gareth O'Neill and Stephen Sherry came on as did David McKenna and Cathal O'Neill. The Gaels did not make any changes which may have been more down to necessity than choice. With a goal needed McAnespies tried to lob the ball into the Gaels box and on one occasion Hyde made a huge leap to win the ball and clear to the cheers of the Gaels supporters. McGrath almost got in for a second goal, but this time Coakley was down smartly to save the ball. Another McAnespies effort at goal went narrowly over the crossbar and the Gaels hung on to win a famous victory for the Club. .
Gaels: E. Connolly, L. Cullen (1-0), C. Cullen, P. McNicholas, R. Kiely, D. Doolan (0-1), D. Comer, R. Hyde, M. Lundy (0-2), N. Graham (0-1), S. Connelly, C. Mulkerrins (0-1), K. McGrath (1-4). Macs: P. Coakley, E. Delmar, E. Rigney, C. McClean, C. Daly (0-1), N. Gallen, C. Donnelly, C. Shine, C. Tobin, D. Lally, L. Kelly (0-1), F. Burke (0-6), J. Doolan. Subs: C. O'Neill (0-1), G. O'Neill, S. Sherry, D. McKenna. Tipperary captured the senior hurling title with a fine display in the second half to win the Boston senior hurling championship for the first time since 2010. Led by Denis Maher at center forward and with some great play from corner backs Robert O'Donnell and David Buckley, Tipperary pulled away in the later stages of the game with a goal from John Roche and points from Kevin Kelly and Neil Foyle. A late goal from Galway gave the westerners some hope, but there was little time left for a second and Tipp held out for the last few minutes to record a great win having called up a number of players from the junior team. The first half was evenly contested with a goal for either side. Robert Bresnehan netted for Galway shortly after the throw-in, but Tipp soon were back on level terms with points from Kieran Morris, Dennis Maher and Morris again. Kevin Kelly netted for Tipperary about 10 minutes into the game but such was the to and fro nature of the game that Galway came right back with a fine point from Sean Curran. The Tipperary corner backs were having an excellent 30 minutes, Robert O'Donnell and David Buckley were out first to several balls into the danger zone, but for a time the clearances fell on barren ground with the Tipp forwards not getting much out of the Galway back line. Galway put a string of points together from Richie Reid (who could have had a goal), Reid again, and two great scores from Stephen Brown as Tipp turned the ball over in the middle of the field. Then it was Tipp's turn to tip the scales in their favour. O'Donnell burst out from defence after winning a ball and drove it over the bar, and Morris pointed three times (2 frees) to put Tipp one to the good. Before the break the sides traded points and it was all to play for heading into the second half, 1-9 to 1-10 in Tipp's favour. The key score came mid way through the second half when Tipperary extended their lead to 5 points after a John Roche goal. Paul Connors had saved well from Denis Maher's initial shot, but Roche was waiting for the rebound and put the ball away. Tipp were leading by 2 points at the time as things clicked in the scoring end of the field for them in the second period. Morris kept the scoreboard ticking over from the frees, and Neil Foyle scored a lovely point after Maher found him with the lightest of measured passes. Galway kept in it thanks to a goal from Robert Bresnehan who got the final touch on a high ball that broke in the box, but Galway's effort appeared to be waning. The sides exchanged points, then came the Roche goal. Tipp added 3 points to one for Galway to open the gap to 6 points with 2 minutes left. Galway gave themselves hope after Bresnehan netted from inside the 14, but time was the enemy of the tribesmen. With the final whistle it was jubilant celebrations for Tipperary and disappointment for Galway for the second year in a row. Tipp: J. Logue, D. Buckley, R. O'Donnell (0-1), J. Prendergast, A. McRedmond, S. McGarr, C. Dempsey, S. Moriarty, K. Kelly (1-2), D. Maher (0-1), K. Morris (0-13, 7F), J. Roche (1-1), N. Foyle (0-2). Galway: P. Connors, J. Fennelly, C. Murphy, R. Bergin (0-1), P. Gahan, JJ Doyle, R. Reid (0-6), S. Curran (0-1), P. Lupton (0-1), P. Ivors, S. Brown (0-4), J. Moylan, R. Bresnehan (3-0). 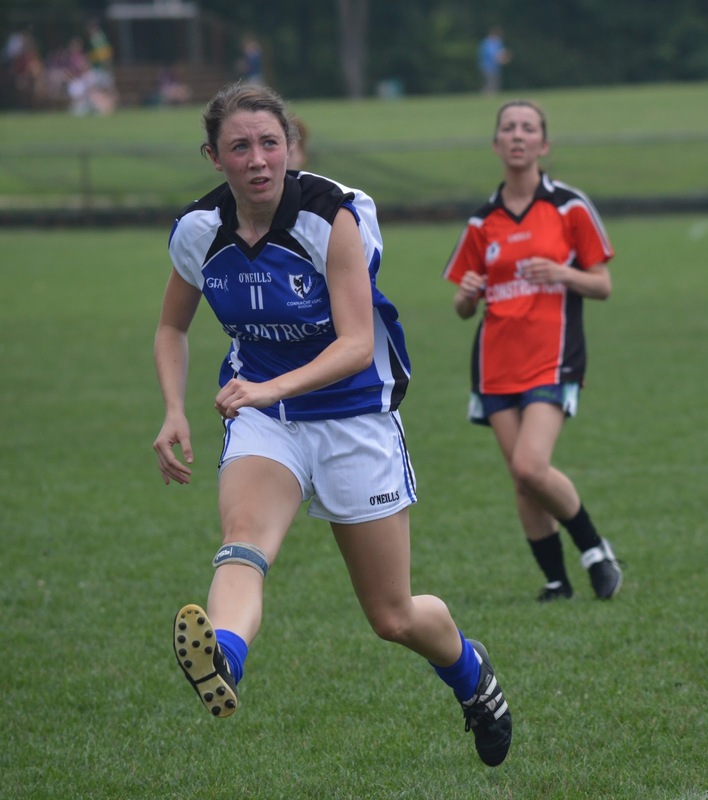 Connacht Ladies make it 2 for 2 in senior football. 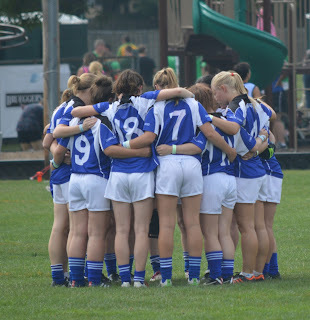 Connacht Ladies proved too strong for the Boston Shamrocks in the Ladies senior football final. The Shamrocks battled hard throughout and kept it close for the first period. Once the second half was 15 minutes old however, it was evident that the cup would be staying with the westerners for the second year in a row. The first half went the way of the Connacht Ladies though the Shamrocks hung in and kept it close. The opening 20 minutes went to the script, with the Connacht Ladies taking a 1-5 to one point lead. The westerners were well on top in all areas of the field, though the Shamrocks battled hard to stay in the game. Ciara Donnelly, Ailish Gormley, and Arlene Fox pointed. Maeve Breen then pointed from half back, before Sharon McGovern got the Shamrocks on the scoresheet. Connacht though pressed home their advantage with a goal from Ciara Donnelly who fired low inside the near post about half way into the opening period. The Shamrocks did not drop their heads and continued to fight hard. Towards the end of the half their efforts paid off as they got back into the game. Brittany Lockwood, Sheila Carroll and Shannon Mullen tried to make the most of every possession, and Sharon McGovern dropped deep and scored two more points following runs as the defence opened up for her. At the break it was a 1-6 to 0-4 Connacht lead. In the second half Connacht extened their lead to 11 points entering the final quarter of the game. Shamrocks attacks were cut short by the diligent work of the Connacht back line. Laura Burns and Joanne O'Connell made some timely interceptions. Connacht netted a second goal through subsititute Catriona Foley who added some punch to the Connacht forward line. The Shamrocks efforts were not helped by the sin binning of Brittany Lockwood. Jane Ward who had been quiet up to this point then came to life and the game became a one sided affair. The Bearagh native tallied a goal and 3 points in the space of 5 minutes, and with that the contest was over. To their credit the Shamrocks continued to give their best effort. Sheila Carroll and Kelly Mullen pointed late in the game to salvage some pride for the Shamrocks, but the defence of the title was in little danger. Two championships in 2 years for Connacht ladies as they head for Cleveland in the hopes of adding a North American title to their already impressive record. Player of the Game: Joanne O'Connell (Connacht Ladies). Shamrocks: K. Rohan, E. King, L. Doyle, B. Lockwood, L. Quinn, A. McDonnell, E. McGovern, S. Carroll (0-1), S. Mullen, K. Scanlon, S. McGovern (0-4), K. Mullen (0-1), R. Kelly, S. Woods (0-1), B. Kelly. Connacht: C. Heraty, S. McAleer, E. Beirne, L. Burns, H. Poff, J. O'Connell, M. Breen (0-1), A. McGlone, S. Brady, J. Ward (1-3), A. Ring (0-2), A. Kerr (0-1), A. Fox (0-1), E. Gormley (0-2), C. Donnelly (2-2). Sub: C. Foley (1-1). Wolfe Tones reclaimed the junior A football championship, a title last won in 2011, with a devastating display against defending champions Donegal. The Tones came out of the gate strong and kept Donegal to a solitary score for the first 25 minutes of the game. With Declan McBride getting sent off in the first half Donegal's chances of a comeback were severely reduced. The Tones were ruthless in the second half and kept the pressure on 12 man Donegal to ensure that no ray of hope would trigger a comeback. The first half was noted for the sending off of Donegal center back, Declan McBride. Things were not going Donegal's way. The Tones had came out of the gate strong and did a great job keepiing the door shut on the Donegal forward line. In doing so, the Tones established a six point lead that really should have been nine. Christy McLaughlin had got Donegal's only score of the first 20 minutes with a goal from a free 45 yards out on the sideline that drifted under the crossbar. Brendan Murray in goal for the Tones had just made a great save from Dean Kelly's shot, but will wondering how the ball made it into the net from the drifting free less than a minute later. Lee Carr, Ger Molloy, and Brian Thornton had pointed for the Tones, and the South Boston side got the goal back from Sean Kelly. The County Down native's low shot came off the crossbar but rebounded off the back of the diving Donegal keeper. 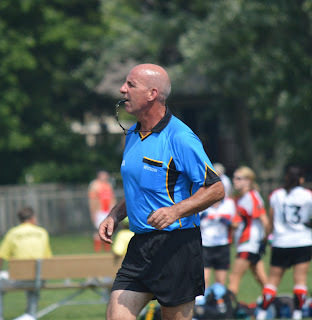 Then came the sending off McBride's reaction to a Michael O'Brien challenge on Christy Bell was deemed excessive. The Tones looked like the efforts of the first 20 minutes were taking their toll. Donegal knocked over 2 more points before the break from the boot of McLaughlin and it was a 1-7 to 1-2 half time score in favour of the Tones. 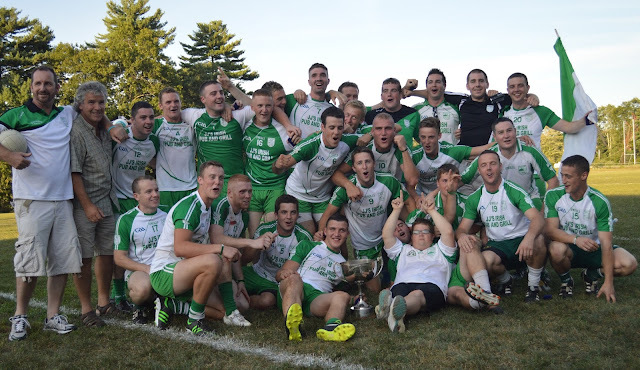 Wolfe Tones celebrate the junior A championship for the second time in 3 years. The second half was all Tones who relentlessly kept up the pressure. The Tones started the second half as strong as the first. Brian Thornton and Carr pointed, as well as Dan McCabe before Carr got away from his marker and buried the ball low with 15 minutes to go. The Tones lead was 12 po nowints and Donegal heads started to drop as hope of coming back were now totally dashed. The northerners managed a consolation goal from a McLaughlin penalty with 5 minutes left. A surprisingly one sided win for the Tones, but fully deserved as the South Boston men looked far hungrier. So, after San Francisco 2 years ago it is off the Cleveland for the boys in blue to try and do a bit better than last time around. Tones: B. Murray, K. Gill, K. O'Regan, M. O'Brien, D. Maguire, P. Collins, A. McEnerney, M. Breslin, B. Thornton (0-2), G. Molloy (0-2), S. Kelly (1-0), L. Carr (1-7), D. McCabe (0-1). Donegal: J. Byrne, S. Wogan, P. McNulty, N. McLaughlin, D. McBride, S. Doherty, M. McGinty, C. Bell, P. McLaughlin (0-1), E. Doonan, K. Curran, C. McLaughlin (2-3), D. Kelly. Wexford Junior Hurlers win the second junior A title for the club. Wexford put their name back on the junior hurling trophy after a one year hiatus with a 5 point victory in a well contested final. It was all square with 10 minutes to go when Wexford tipped the balance with a goal and 2 points. Tipp had a couple of frees near the end and had no choice but to go for goal, but each time the Wexford back line held and cleared to preserve the victory. About half way through the first period the sides were level on an unusual score of 2-1 to 1-4. Wexford had netted twice, the first from Tommy Walsh, and the second from ace corner forward Colm Kerins. Tipp had got off to a nice start with 3 points, 2 from John Pender and one from Sean Delaney. Wexford leveled with the first goal, but it was answered by Tipp with a 3 pointer from a 21-yard free taken by Pender. Pender was the main man in the middle for Tipperary, and taking the frees. Dave Power, however, was a match for his counterpart from the dead ball and apart from a couple of efforts that went awry was largely on the mark. Other scores in the Wexford column came from Greg Lundy, Johnny Callen, and a point from Kerins. Tipp's John Roche got on the scoresheet along with Bernie O'Regan and at the break it was Wexford ahead by a point, 2-6 to 1-8. Gearoid O'Connor made it all 5 Wexford forwards with scores shortly after the restart. Wexford hit a couple of wides and looked like they were putting the pressure on their opponents. Tipp battled back. John Kindregan at center back led the effort, with Pat Moriarty in the middle of the field also doing well. After Wexford went up by 3, points from Roche, and Pender (2) hauled them back in. With the sides level and entering the final 10 minutes, Tipp missed a couple of back to back chances to take the lead, with the ball drifting wide on each occasion. Wexford on the other hand took their opportunites when they came down the stretch. Power put the Brighton side up by a point with a long range free and with the game on the line there was a heightened sense of urgency. Tom Elward, who played well throughout the game in the Wexford back line, made a charge up the field and cleared into the Tipp box where Kerins gathered and drove the ball home with style. Tipp had their chances near the end that were well dealt with by Wexford's defensive wall, and Kerins tallied a lovely score to cap off the victory. Wexford off the Cleveland to try and capture the second North American Cup for the club. Wexford: C. Neville, P. Nolan, T. Dunne, T. Elward, D. Magill, JJ O'Neill, N. Freeman, G. Lundy (0-1), J. Callen (0-1), G. O'Connor (0-1), T. Walsh (0-1), C. Kerins (2-3), D. Power (0-6). Tipp: M. McCormick, J. McGrath, S. Sinnott, M. Moriarty, J. Kindregan, P. Jordan, A. McRedmond, P. Moriarty, B. O'Regan (0-1), J. Pender (1-8), S. Delaney (0-1), B. Bennett, J. Roche (0-2). Donegal Captain Jason McDaid looks a happy man! It took extra time to separate Aidan McAnespies and Donegal in the junior B football final. It appeared to be all over with 10 minutes of normal time to go, even though Donegal held a one man advantage. Playing down a man, McAnespies still looked very much in control and had held their opponents scoreless up to that point in the half. Donegal struck with 2 goals and a point in the space of 2 minutes and almost won the game in the 60 minutes, but Owen Fleming pointed for McAnespies to force the extra time. Still, Donegal had got a second chance, and they made sure they took it scoring 7 points to McAnespies' one in the overtime period. At the end of the first half it was McAnespies who led by a point. After Donegal had pointed twice from Matthew and the young Kieran McDevitt, Jonathan Downey netted following a good move involving Stephen Magill and Paddy Stones. McAnespies then built the lead to three points with John Kindregan and John Roche, both of whom had just played in the junior hurling final, Downey and Stones playing well. Donegal strung four points together as they came back into the game. Jonathan Byrne grabbed a foothold in midfield and Jason McDaid and Hugh Devine converted. Owen Fleming and Stones pointed just before the half to make it a 1-5 to 0-7 half time lead for McAnespies. Brian Kelly up highest for this ball. The second half saw McAnespies outplay Donegal in most facets of the game and with 10 minutes to go it looked as though the 2011 champions had it in the bag. Donegal looked all out of ideas and did not score, and truth be told, did not look like they had a score in them, for the first 20 minutes. The points sailed over the bar from Owen McCosker, Stones, Magill, Paddy McCusker, Downey and Fleming. What was disconcerting from a Donegal viewpoint was that John Roche had been sent off 10 minutes into the half for a second yellow card, so the northerners had an extra man. McAnespies played simple, sensible football and looked like they were the side with the man advantage. Things were to change dramatically. In the space of 3 minutes Donegal had reduced the lead to a point. The high ball into Brian Kelly, who had been moved to a forward position, eventually paid off. Jonathan Byrne and substitute Paul Boyce netted a minute apart. Jason McDaid pointed and Donegal had new life. Donegal were now winning the battle for possession. Kelly pointed and Boyce put the go ahead score over the bar. Fleming forced the extra time with a point in the last minute. Donegal took full advantage of the second chance and their cause was helped after Downey was shown a second yellow card. Substitute Barney Boyle got first score of the additional time, Kelly the next and Jason McDaid netted. After the turnaround it was curtains for McAnespies as Declan Slevin was shown the line, wing back Hugh Devine pointed the last 2 scores of the game and the junior B football championship was delivered to Donegal. Donegal: M. Byrne, P. McCafferty, P. Doherty, M. Coleman, D. Doherty, H. Devine (0-3), B. Kelly (0-1), J. Byrne (1-0), K. McDevitt (0-2), J. Doogan, E. Byrne, J. McDaid (1-4), M. Cunniffe (0-1). Subs: P. Boyce (1-0), Barry Boyle (0-1). Aidan McAnespies: N. Duffy, G. Trainor, A. Kellet, E. Daly, P. McCusker (0-1), D. Gormley, J. Kindregan, J. Downey (1-2), P. Stones (0-2), J. Roche (0-1), S. Magill (0-4), O. Fleming (0-4), O. McCosker (0-1). Subs: D. Slevin, J. McKenna. Reports and photos coming tonight. 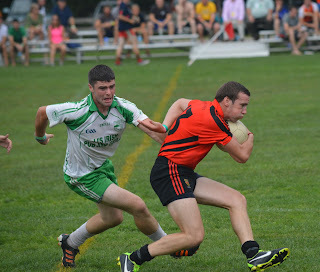 Next weekend sees the climax of the Boston Northeast GAA championships, with 8 finals being contested. The winners of each final will represent the Divison at the North American Finals in Cleveland, Ohio. With 13 of the 24 clubs in the Boston Northeast division having an interest in at least one of the games it promises to be an action packed weekend. The Connemara Gaels face Aidan McAnespies in the senior football final. The Connemara Gaels will meet Aidan McAnespies senior football final. The Blues and McAnespies could not be separated after extra time in a wonderful game on Sunday, and the replay was won by McAnespies on Tuesday night. The Gaels came through against Christopher's on the back of two Michael Lundy goals and a Ryan Hyde strike to contest their second final in 3 years. McAnespies would have to be the favoured team in the final. 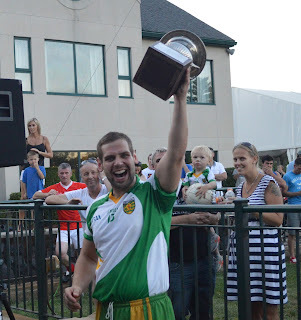 The South Boston men came through 2 tough playoff opponents in the Wolfe Tones and Shannon Blues to make the final. With the likes of Collie Donnelly, Declan Lally, and Jamie Doolan on the field, and with Stephen Sherry and Mark Treanor on the bench McAnespies have a deep panel to draw from. The Gaels dispatched of Kerry and Christopher's with a bit more ease, and by contrast the squad has been severly hurt by injuries and several players who returned to Ireland, and is very much down to the bare bones. Sean Conneeley, Damien Comer, Michael Lundy and Co. will no doubt give it their best effort but it is hard not to see McAnespies booking their flights to Cleveland for Labor Day weekend. Senior hurling will feature last year's beaten finalist, Galway who will face Tipperary. Galway defeated Brighton rivals Wexford Sunday with a great performance but will meet table toppers Tipp in what promises to be a close game. Each side has match winners, but Galway's will need to step up and be counted if they are to win the championship. Captained by Cronan Dempsey, Tipp are well balanced with Robert O'Donnell in the back line, and a forward line with Denis Maher and the electric Kieran Morris. Galway's captain, John Moylan has had a great season so far, and players of the caliber of Robert Bergin, Padraig Gahan, Philip Ivors and and Pat Lupton are well capable of delivering the title to Brighton. 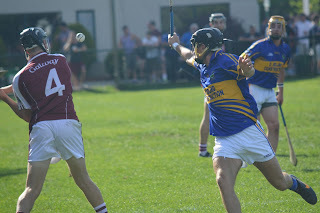 It is a hard one to call, but with Tipperary having beaten Galway on both regular season occasions the tribesmen might have the motivation to raise their game and regain the championship they last won in 2011.
the Shamrocks one more time Sunday. 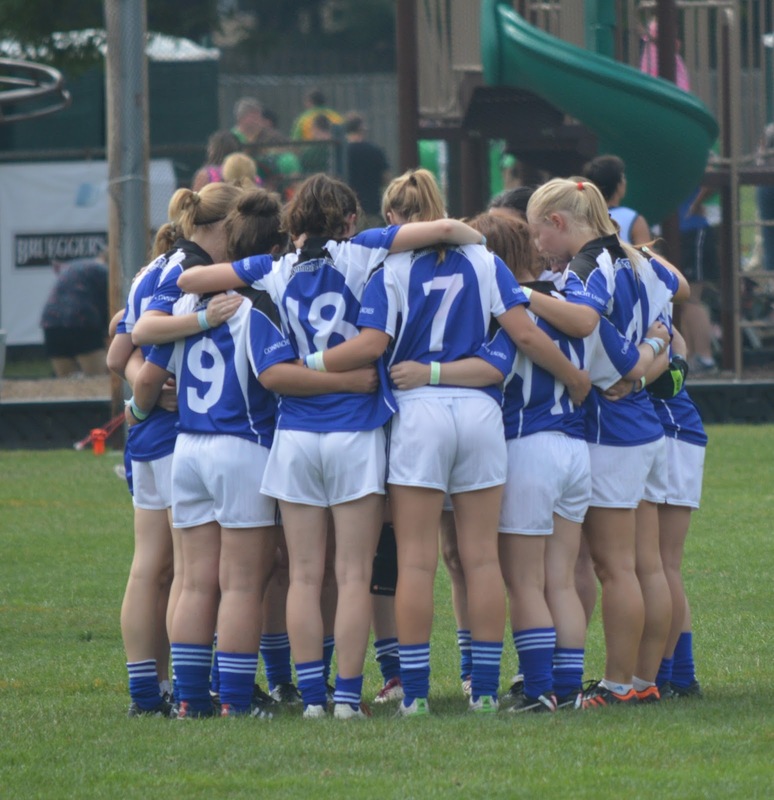 Ladies football sees hot favorites Connacht Ladies return to defend last year's title and the Boston Shamrocks will have it all to do to try and pull off what would amount to an upset win. The Shamrocks gave Connacht Ladies problems at times in their last encounter, but conceded easy scores. If they are to triumph against the odds they will have to tighten up considerably when in possession in their own half. Brittany Lockwood and Edel McGovern anchor the full back line and will need to be on their game Sunday against a top class Connacht forward line that contains the likes of Jane Ward, Amy Ring and Jackie McDonagh. Connacht hold the aces, but if the Shamrocks can rattle their opponents early anything can happen from then on. Donegal junior As will be looking to retain the Pat Callaghan Cup when they meet Wolfe Tones. 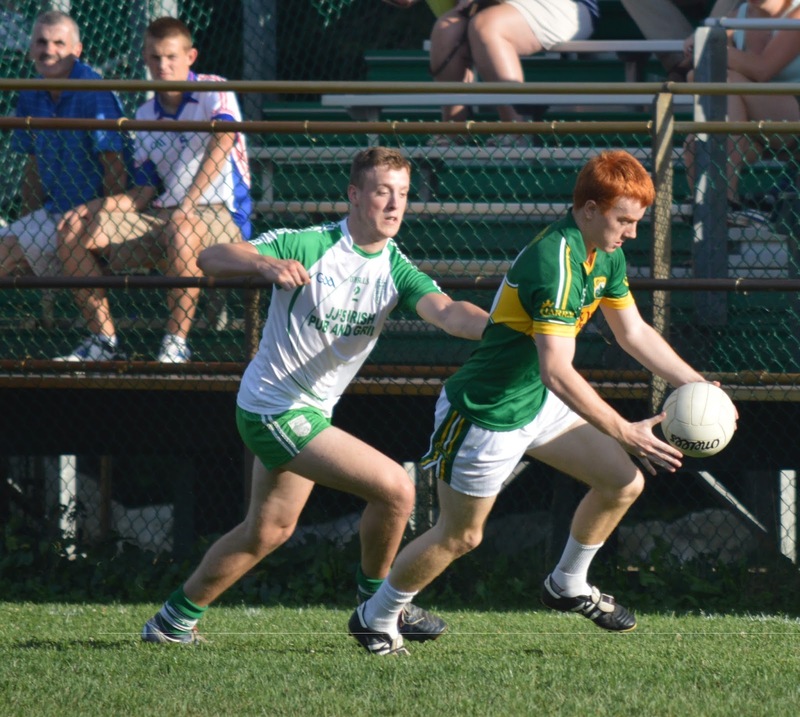 In junior A football Wolfe Tones and Donegal meet in a repeat of last year's final. the Tones will be trying to dethrone the Pat Callaghan Cup holders. Donegal have some excellent players in Christy Bell, Paul McNulty, and Christy McLoughlin. The Tones will be looking for big performances from Mike O'Brien, Kenny O'Regan, and Gavin Walsh to try and top their opponents. Donegal also are in the junior B football final and will face old rivals Aidan McAnespies who came through an extra time semi-final against Shannon Blues last Saturday. Wexford and Tipperary will face off in the junior A hurling final, while the junior C hurlers of Portland Maine and Worcester Mass will meet in the junior C hurling final. In a meeting of the old rivals, Tír na nÓg and the Shamrocks will contest the Ladies junior football final Saturday. The Irish Cultural Center is located off Route 138 in Canton Mass. Go to www.irishculture.org for directions to the ICC. 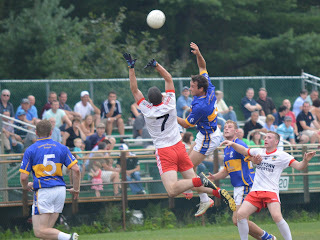 Check out www.bostongaa.com for GAA news and information. Every year you can be guaranteed a cracker of a game at the ICC and Sunday afternoon Aidan McAnespies and Shannon Blues served one up. It was tied at half time, full time, the extra time break, and at the end of extra time - meaning that a replay Tuesday night at 5:30 will be required to separate the teams. With the sending off of Sean Moriarty in the second half of normal time McAnespies had the impetus to push on and win the game but the Blues battled hard and it was McAnespies who had to rescue the draw at the end. McAnespies will look at two missed goal chances in extra time as the Blues performed defensive heroics to keep the ball out of the net, and wonder how it all came down to a Frankie Burke free to force the replay. Burke held his nerve and with the score the teams meet again. It was do or die stuff when the Macs met the Blues. It was even stevens in the first half as both sides played some good football. The Blues got their game going after McAnespies had taken a 4 points to one lead. Barry John Keane and Cathal Moriarty accounted for 3 points to level the scores. Moriarty's shot cannoned off the upside of the crossbar. Later in the half the Blues almost had another goal, but Paddy Coakley made a fine first save and the post played a part in keeping Kieran Hurley's shot from the rebound from crossing the line . The Blues back line did well to keep McAnespies forwards from making too many inroads, but a breakthrough for McAnespies eventually came with a well worked move that put Cian Tobin with just the keeper to beat, and the Kerryman did the honors. The Blues came back with points from Keane and Kieran Hurley to level matters at the break. Ten points to a goal and seven with 30 minutes to go. Declan Lally on the run for McAnespies. The second half was full of incident. After Kieran Hurley was tripped in the penalty area while shooting, Keane stepped up and took the penalty, wrongfooting Paddy Coakley. Shortly after another potentially game changing incident occurred after Sean Moriarty was sent off with about 20 minutes left to play for a second yellow card offence. The held a 2 point lead at the time. McAnespies capitalized with points from Declan Lally and Tobin to level the scores. The Blues can play some attractive football at times and in spite of being a man down put together some good scoring moves. BJ Keane pointed twice to put the Blues ahead, the second score a lovely point from the Kerry star. Play was moving quickly up and down the field now, and McAnespies netted a second goal. Frankie Burke, who worked extremely hard throughout the game, found Doolan in front of goal and the Dr. Croke's clubman netted easily. The Blues still pushed ahead and continued to push forward despite the deficiency in personnel. Darragh Treacy, Keane and Sean Kiley pointed to put the Blues 2 ahead with time running out. McAnespies finished with two points, one from Burke that exemplified his hard work. After missing a free high off the post, Burke won possession back and made good on his miss. Tobin leveled affairs before 60 minutes ran out, and it was extra time. Keane and Shane Brosnan pointed in the first period of extra time, and Burke and David McKenna added points in the McAnespies column as the nails of both sets of supporters became worn to the quick. It was at the end of the the period that McAnespies had the goal chances. First Declan Lally took advantage of a poor kickout and Blues keeper Dara O'Brien held his ground well to allow Kevin Hartnett time to get back behind him and turn the shot away for a 50. Burke had the second chance as McAnespies again opened up the Blues defence, but the Annaghdown man fired the second chance across the face of the goal as hearts were in mouths. A goal for either side at that stage would surely have won it. Level at the turnaround. The second period of extra time could not separate the sides either. Cramping set in for several players as it was do or die stuff, and benches were emptied of subs. Any set of fresh legs would do at that point. The Blues took a one point lead into the final 2 minutes, and then Luke Kelly was sent off for his reaction to a tackle. McAnespies now a man down and in need a score to tie it up. The opportunity fell to Burke who split the posts with his shot. The teams must do it all over again on Tuesday night. Macs: P. Coakley, E. Boland, E. Rigney, C. Daly, C. McClean, N. Gallen, C. Shine, C. Donnelly, C. Tobin, D. Lally, L. Kelly, F. Burke, J. Doolan. Blues: D. O'Brien, G. Ryan, K. Hartnett, S. Kelly, P. Domican, S. Moriarty, S. Brosnan, M. Butler, C. Moriarty, D. Treacy, BJ Keane, K. Hurley, C. McHugh. The Connemara Gaels caused somewhat of a surprise dumping Christopher's out of the senior football championship with a four point win. The Gaels rode 2 first half Michael Lundy goals, and a third early in the second from Ryan Hyde, all the way to the final whistle. Christopher's looked like they could force extra time and pushed hard in the final 15 minutes for a vital score, but the Gaels did enough to hang on until the final whistle. Ryan Hyde on the attack for the Gaels. The Gaels enjoyed the better of things for most of the first half, in large part thanks to 2 goals from Michael Lundy. On each occasion Lundy used his speed to make his opening and finished both times. Christopher's effort sputtered apart from 3 points early in the half. The Gaels matched with a flurry of points coming from Lundy, Kevin McGrath, and Noel Graham. Lundy's second goal put the Gaels into a 6 point lead with 10 minutes to go until the break. Christopher's came back into it with an excellent David Culhane point, another from Padhraic Lucey. Just before half time a harmless looking ball into the Gaels square from Dan Kenneally drew the keeper and corner back, and Chris Brady nipped in between the two to fist into the net. The goal set up a finely balanced second half, at the break it was 1-5 to 2-4 in the Gaels favour. Hyde and Mark Delaney rise for the ball. The Gaels made up for the goal conceded at the end of the first half with a three pointer right after the restart from Ryan Hyde. Noel Graham followed with a point and the six point lead was quickly restored. The Gaels efforts began to flag in the latter stages of the game as fatigue set in and Christopher's set about narrowing the gap. Michael Quinlivan, who had a quiet game by his standards, Mark Delaney, and Brady pointed as the Gaels conceded ground and gave away frees within scoring range as the game approached the last 15 minutes. Four scores on the trot from Christopher's reduced the deficit to a single goal. Christopher's then lost Robert Bresnehan who needlessly got himself sent off after a foul on Lundy. The Gaels continued to live dangerously though as Christopher's still pressed forward with nothing to lose. After Noel Graham pointed a free, Eoin Connelly was forced into making a brave stop from Gary O'Leary late in the game. Quinlivan pointed the ensuing 50 with room to spare. It was Coleman Mulkerrins who put the insurance point over the bar to keep more than the goal in it and the Gaels are in their second Boston senior football final in 3 years. Christopher's: P. Kenneally, C Murphy, D. Culhane (0-1), M. Delaney (0-1), D. O'Sullivan, E. O'Neill, D. Kenneally, P. Lucey (0-1), K. McAllister, G. O'Leary, P. Quirke (0-2), C. Brady (1-5), M. Quinlivan (0-2). Gaels: E. Connolly, L. Cullen, C. Cullen, P. McNicholas, R. Kiely, D. Doolan, R. Hyde (1-0), D. Comer, S. Connelly, N. Graham (0-5), M. Lundy (2-2), C. Mulkerrins (0-1), K. McGrath (0-2). Galway proved to be a little too much for last year's champions, Wexford, in a replay of the 2012 final. After a close first 15 minutes in which Wexford more than matched Galway, the tribesmen netted a goal through Robert Bresnehan and Galway stepped it up a notch to pull away an record a comfortable win. Galway will face Tipperary in the final next week, a team that have beaten Galway each time they have met this year. Galway finished the first half the stronger of the two teams and set themselves up well for the second period. After an evenly contested first 20 minutes, Galway got the breakthrough with a goal from Robert Bresnehan. Bresnehan had tried to beat Ed Spruhan earlier from the other side and Spruhan had saved well. Not this time as the low hard shot sneaked inside the foot of the post. The goal put Galway into a 2 point lead. Up to that point Wexford had done well to put themselves into a one point lead. Simon O'Brien had hit the post with an effort at goal, and David Drake put a great sideline cut over the bar. From the goal on however, the tribesmen dominated play. Robert Bergin in the middle of the field sparked to life and Pat Lupton at corner forward proved to be a handful for the Wexford backs. Scores came from Bergin, Richie Reid, and Lupton as Galway opened up some distance between themselves and their opponents. Eoghan Kavanagh and Simon Aylward kept Wexford in touch with a point each, and at one point Spruhan saved what looked like a sure Lupton goal with a fantastic stop. At the break it was 1-10 to 0-8 in Galway's favour. Galway will contest their fourth consecutive senior hurling final next week. Galway extended their lead early in the second half. Richie Reid and Bresnehan pointed four times between them. Wexford managed a point from Aylward but needed something to spark the side to life. After Simon O'Brien was pulled down in the box Wexford were awarded a penalty and Aylward netted. Galway, however, answered with three points on the trot. Philip Ivors and Pat Lupton were motoring in the forward line and Galway had the look of a team that was not going to let the setback put them off course. Bresnehan pointed twice to restore the Galway lead. Wexford got another chance at hope after JJ Doyle unfortunately mis-directed the ball into his own net, but once again Galway had their minds set on victory. Ivors pointed to put four points between the sides and a late point from Drake was the final score for Wexford. Galway will contest their fourth final in a row when they meet Tipperary next Sunday. Galway: P. Connors, J. Moylan, C. Murphy, G. O'Brien, P. Gahan, JJ Doyle, R. Bergin, S. Curran, S. Brown, P. Ivors, R. Reid, R. Bresnehan, P. Lupton. Wexford: E. Spruhan, M. McCaffery, D. Redmond, M. Warnoc, P. Nolan, S. Aylward, J. Kehoe, B. Clince, D. Drake, E. Kavanagh, T. Maloney, T. Murphy, S. O'Brien. 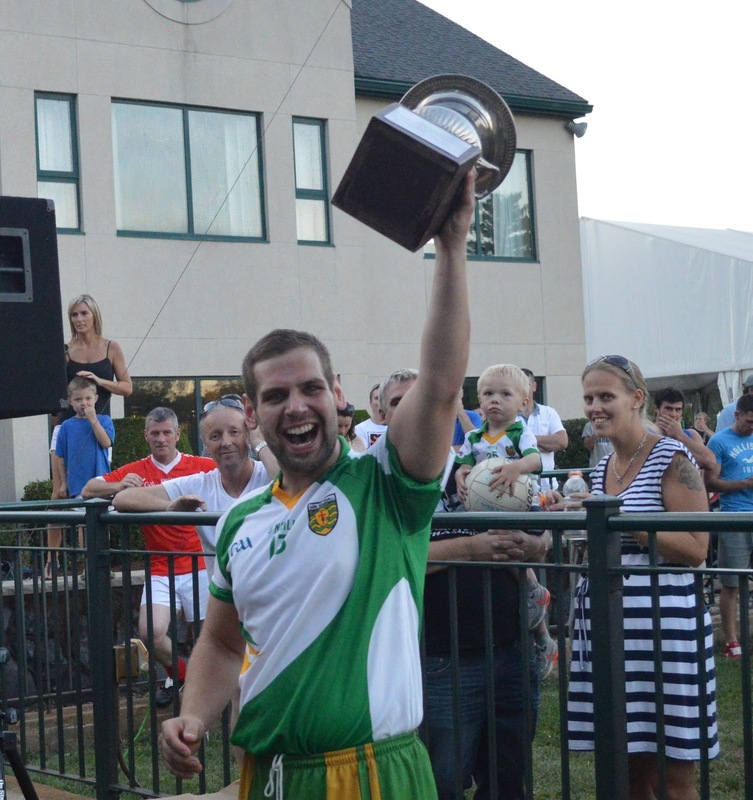 Donegal put paid to a spirited Shannon Blues junior team that featured 5 American Born players in the side in the second of the junior A semi-finals. The Blues had come through as winners of the A2 section, and really should have got more out of their first half performance. Playing very well, the Blues conceded a goal after turning the ball over when coming out of defence, and trailed at the break. Donegal started the second half with three points on the trot and after a Christy Bell goal mid way through the half , the northerners always looked like winning the game. Conor Fitzgerald readies a shot. The Blues will have been kicking themselves not to have held the lead at the break. Holding a six points to three lead the Blues made the clinical error of giving the ball away coming out of defence, and the dangerous Davitt Walsh at corner forward capitalized with a goal. There was about 20 minutes gone in the game at that point. Shortly afterwards Walsh had to leave the field after sustaining a severe shoulder injury. The Blues had been playing well up to that point. James Feeney played a leaders role at center forward, and getting the ball into the hands of corner forward Owen Walsh was the key to the Blues success. Walsh had accounted for 3 of the Blues points, one from a free. Paul McNulty though had an excellent first 30 minutes at corner back for Donegal and on more than a couple of occasions disrupted promising looking Blues attacks deep in the Donegal half. The tide started to turn in Donegal's favour somewhat as the half time whistle approached. Two Christy McLaughlin points before the whistle had Donegal in a 1-6 to 0-7 lead at the break. Donegal's Paddy Wanish McLaughlin and Pat Murray. The Blues worked hard to try and swing the game back in their favour in the second half, but gave the ball away needlessly on too many occasions. Donegal hit with 3 quick points after the restart to build a 5 point lead. The Blues came back with 2 points from Walsh and Conor Fitzgerald, and nearly had a goal but Sean Black saved well at the feet of Owen Walsh. The Blues had another chance to level the game after Tommy Hernon worked hard to get the ball across the face of goal, but there was no Blues man there to finish the job. Donegal hit with goal number 2 right after that chance, Christy Bell went on a trademark run and buried the shot from inside the 21. Donegal were now in the drivers seat. The sides traded points coming up to the final whistle. Dean Kelly put a couple of signature scores for Donegal. A goal was required from the Blues to have a chance, and it never came. Donegal saw out the game without looking in danger and in a repeat of last year's final will face Wolfe Tones next Sunday. Blues: G. Henry, S. Sinnott, K. Nugent, M. Keegan, D. O'Brien, C. Sullivan, C. Mullen, P. Murray (0-2), C. Fitzgerald (0-1), J. Feeney (0-2), N. Murray, O. Walsh (0-7), T. Hernon. Sub: C. Moriarty (0-2). Donegal: S. Black, P. McNulty, N. Doherty, S. Doherty, D. McBride, P. McLaughlin (0-7), C. Bell (1-1), D. Kelly (0-5), K. Curran, E. Doonan, M. McGinty (0-1), C. McLaughlin, D. Walsh (1-1). Wolfe Tones missed a golden opportunity to advance to the semi-finals next week as they fell to Aidan McAnespies in the final minutes of a closely contested game. Both sets of forwards misfired often, but it was the Tones who missed 4 chances to even the scores and force at least extra time in the last 5 minutes. A goal in each half proved to be the killer blows for McAnespies, though the 2011 champions will be looking for a better performance in next week's semi-final. Cathal Shine and Thomas Moolick contest the kickout. The first half was evenly contested with the Tones taking the game to McAnespies. The first scores came from Mark Treanor for McAnespies and blood sub, Jason Hickson for Wolfe Tones. The Tones played well in the back line and cleaned up a lot of loose ball. Points were tallied from John Comerford, Donie Smith, Danny Egan and Enda Smith. McAnespies looked a little wasteful kicking some good chances wide of the posts, but Stephen Sherry and Jamie Doolan were on the Mark. With the first 30 minutes almost up and the Tones in a 5 points to 4 lead McAnespies delivered a sucker puch to the Tones with a goal. Play was stopped to tend to an injury to Enda Smith and referee Martin O'Connor blew for McAnespies to restart play. McAnespies worked the ball down the field all the way to Doolan who finished from a tight angle to give his side a 2 point lead going into the break. It was all square going into the final 10 minutes of the second half. McAnespies netted a second goal from Stephen Sherry early in the half. Cathal Hynes had saved the initial shot well, but Sherry was first to the rebound to put the ball into the net. Wolfe Tones did well to come back. Donie Smith put 4 points over the bar as Tones tried to keep the door closed at the back. The Tones worked themselves into a one point lead with Thomas Moolick and the Smith brothers driving their side forward. Cian Tobin leveled the scores with 20 minutes gone, and with 5 minutes to go, as each side vied for the advantage, Conor Daly stole upfield from wing back to put his team ahead. With time running out Wolfe Tones kicked four chances wide of the posts, the last of which fell to John Comerford whose angled effort drifted wide of the far post. A disappointing loss for the Tones, and McAnespies survive a squeaker and will meet the Shannon Blues in next week's semi-final. Macs: P. Coakley, E. Delmer, E. Rigney, C. Daly (0-1), C. McClean, N. Gallen, C. Shine, S. Sherry (1-1), C. Tobin (0-1), M. Treanor (0-1), L. Kelly (0-1), J. Doolan (1-2), F. Burke, Tones: C. Hynes, J. Gonoud, K. Cleere, B. McShea, J. Kelly, S. Higgins, C. McCarthy, T. Moolick, D. Egan (0-1), J. Comerford (0-2), E. Smith (0-1), S. Kelly (0-2), D. Smith (0-5). Sub: J. Hickson (0-1). The Connemara Gaels advanced to the semi-final of the senior football championship with a convincing win over Kerry. The Gaels were on top in most areas of the field throughout and looked to be well on their way after Ian Burke netted 11 minutes into the second half. The Cullen twins did well at corner back to hold Darragh O'Brien and Shane O'Callaghan to a handful of scores from play. The Gaels face a different prospect in Christopher's next Sunday in the semi final. The Gaels largely dominated the first 30 minutes of play and went in at the break 5 points to the good. The only real blemish on the back line was an early Darragh O'Brien goal that was well worked and well taken. O'Brien was played in with a lovely ball over the top and finished well. The Gaels answered in style with six points on he trot before Coleman Mulkerrins netted a fine goal to put the Gaels in the drivers seat. Traffic was virtually one way now as the Gaels dominated the midfield stakes, and snuffed out the Kerry attacks. Kerry managed points from David Larkin and O'Brien before half time, and at the break it was a 1-9 to 1-4 Gaels advantage. ...Cullen this time with O'Callaghan giving chase. Kerry got the first score of the second half through Darren Clabby. The next 4 scores came from the Gaels as the Connemara men cemented their dominance and a Kerry turnaround looked increasingly unlikely. Graham and Burke pointed from frees, before Mulkerrins added another point and Burke a goal with 10 minutes gone of the restart. With the goal the Gaels went 10 points into the lead and the outcome looked increasingly inevitable. Kerry put some pressure on the Gaels defence in the final quarter and forced Eoin Connolly into a couple of good saves. Ronan Kennedy who entered as a sub almost netted, but his shot flew narrowly over the crossbar. O'Brien, Colm Schwer, and Darren Clabby pointed as full time approached, but the hole was too big for points to dig Kerry out. A couple of goals were needed at that stage. The Kingdom won a penalty in injury time and O'Brien netted to improve the look of the score, but it was the end of the road for Kerry and the Gaels move on to the semi-final. Kerry: P. Bailey, S. Driscoll, D. Larkin (0-1), M. Godley, B. Kelliher, E. Mullen, S. Cunningham, I. Whelan, C. Schwer (0-1), D. Clabby (0-2), J. Fitzpatrick, S. O'Callaghan, D. O'Brien (1-4). Sub: R. Kennedy (0-1). Gaels: E. Connolly, L. Cullen, C. Cullen, S. Conneely (0-1), R. Kiely, D. Doolan, R. Hyde, D. Comer (0-1), M. Lundy, N. Graham (0-3), D. Hogan (0-1), I. Burke (1-5), C. Mulkerrins (1-3). Tipperary made sure of their place in the senior hurling final with a comfortable win over a Galway side that seemed to accept their destiny of a semi-final placing. With 4 points between the teams mid way through the second half Sean Moriarty netted a well taken goal to open a gap between the teams and Tipp went on to win with a bit to spare. Tipperary went into the break up two points after a lacklustre first half of hurling. The free taking of Kieran Morris and a point each from Aaron Ryan and Cronan Dempsey had Tipp just that little bit on top of Galway. Galway tallied a couple of points from John Moylan and Sean Curran added to the tally and at the break it was 0-6 to 0-4 in favour of Tipp. The second half saw Tipp keep their noses in front. Galway had a good chance at a goal shortly after the restart. Moylan found JJ Doyle in front of goal, but Doyle's pull was saved by James Logue in goal for Tipp. With 20 minutes of the second period expired, Galway had managed just 2 points, one each from Curran and Moylan. Tipp fared a little better with 4, one from Neil Foyle and 3 from Morris. With about 10 minutes left in the game Sean Moriarty fired home an excellent goal to put Tipp 7 points to the good. With little to show that Galway had a comeback in them the outcome looked inevitable. There were a couple more goal chances for Galway, but on each occasion Logue was there to intervene and prevent the ball from crossing the line. Tipp finished out the game outscoring Galway 7 points to one. A handy win for Tipp, while Galway will wait to see whether they will be facing Wexford or Fr. Tom Burke's in the semi-final next Sunday. Galway: P. Connors, P. Ryan, C. Murphy, D. McCormack, D. Fives, D. O'Connor (0-1), R. Bergin, S. Curran (0-2), S. Brown (0-1), R. Reid, JJ Doyle, P. Lupton, J. Moylan (0-5). Tipp: J. Logue, D. Buckley, R. O'Donnell, S. O'Connor, G. Brennan, S. McGarr, C. Dempsey (0-1), A. Ryan (0-1), S. Moriarty (1-1), D. Maher (0-1), K. Kelly (0-1), N. Foyle (0-2), K. Morris (0-10).